Join us for a great workout, great food and great company! To register email Janet or call: (415) 945-9788. 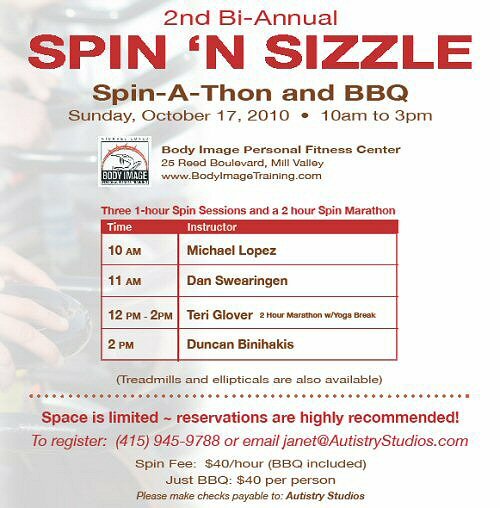 Sign up for a 1-hour Spin with Michael, Dan, or Duncan (or sign up for all three!). Or, sign up for a special 2-hour Spin and Yoga with Teri. The suggested donation is $40 for each 1 hour Spin and $80 for the the 2-hour Spin. To pay online go to the Donate Page! But let Janet know which session or sessions you would like. The BBQ begins at the end of the first Spin – 11am. And it continues throughout the day. So, work out hard and eat hearty! So much has happened in these last weeks! Where to begin? 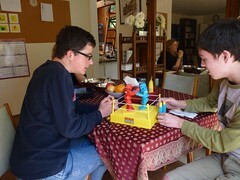 Let’s start with news of the new space: 37 Duffy Place, San Rafael. Our goal is to be moved in by November 1st. The phones are installed and the DSL is connected. The carpets have been cleaned and all the windows washed. But there is a lot of work left to be done. The Ryder Foundation Event: Comedy for Kids with Autism. We had a great time on Saturday, Sept 11th at the Palace of Fine Arts. 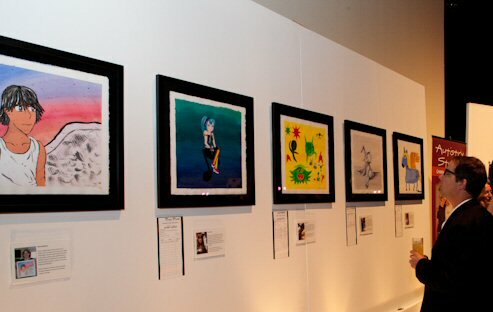 Five of our Autistry Artists had paintings on display and each one sold! We all had our photos taken many times. It was a beautiful evening. To see photos go to: Henley Photographs. 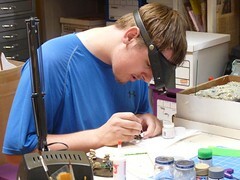 The Autistry Studios workshops are in full swing. New projects and some new faces! Friday Build Stuff with Dan: Adam has joined us and is building a computer from scratch. This week he installed the mother board and various other essential parts. He turned it on and smoke issued forth! 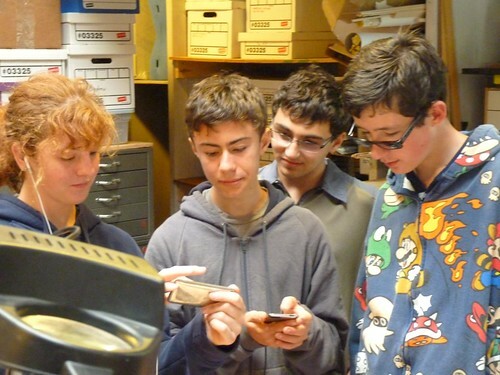 Hmm – maybe that power supply wasn’t so good! Ross has a wonderful new project idea based on the image of war as a game of chess with infantry as pawns. Corey is designing a rather macabre rendition of the Hills Are Alive… And, Ian G. has finished his fabulous diorama of battling skeletal figures. Saturday Film Stuff with Nate: Peter is working on a very interesting live action film featuring himself and Steven in the starring roles. Steven, when not in front of the camera, is creating another unique epic based on his own characters. Ian has developed a storyline combining Santa Claus and Kung Fu Fighting – this should be fun. And, Andrew is putting the finishing touches on his Rush Limbaugh Roadside Diner. Sunday Build Stuff with Dan: Devon is making a rat’s nest – no really, a diorama of pack-rat, Rattina. She is made of clay and sits in a nest of gathered treasures. Daniel has two projects going – one is his fiberglass chest armor and the other is his Halloween costume. Both are amazing. Sawyer’s fort has really progressed. He poured resin for the surrounding water and created a great dock. Ryan is adding very cool little buildings to his switch track and will soon be adding the final scenery pieces – almost done! 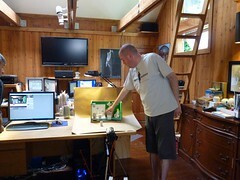 Tuesday Build Stuff with Dan: Owen has created an awesome set for the filming of Party in Fizzletown. He has also nearly finished the illustrations for his original story, Eunice the Unicorn. Abe has created several new seasonal greeting cards for Halloween, Rosh Hashana, and Thanksgiving. He is becoming quite an expert at Paint Shop Pro and is looking forward to learning InDesign. Erik’s waterfront is looking so good you want to dive right in! We are all having a great time building amazing worlds and imaginative creations. Looking forward to building even bigger stuff in the new space! We had gotten behind on this! Seven new photo galleries are listed on our Photo Galleries pages.